Last week I sat in a meeting with colleagues from across the PR industry that was discussing precisely this question as part of the “Content Marketing” work stream set up by the PRCA, the largest body representing PR professionals in the UK and the largest body of its kind in Europe. By the middle of 2014, the PRCA hope to have moved our thinking forward on the subject and attempted to clarify what is – and what is not – “Content Marketing”. For the moment, the field is wide open for interpretation and potential confusion. So why does “Content Marketing” matter and is there any merit searching for some form of clarification that will enable our thinking to be bit less fuzzy on the subject? A quick search on Google comes up with 789m references to “Content Marketing” and you could be forgiven for thinking that “Content Marketing” is actually ‘public relations’ by another name. After all, what’s PR if it isn’t content that useful, I hear you ask? Well, you may have a point. But of course what passes for ‘content’ these days can be highly contentious, to say the least. Every company or organisation can make a valuable contribution to the education of the marketplace, a point made in High Impact Marketing That Gets Results. The question is how can this be best achieved and how can the outcome of this effort be measured? “Content Marketing” is often referred to as being the preferred answer. Many organisations and businesses struggle in understanding how best to get information out into the marketplace. Often this can be a combination of direct-to-consumer and client news releases, background briefs and case studies and search engine optimization. Should they now re-focus their efforts and budgets on “Content Marketing”? Where does traditional PR stop and “Content Marketing” begin, or for that matter vice-versa? What’s clear from the discussions that took place last week is that there’s a fair amount of divergence of opinion around what’s meant by “Content Marketing” and there’s a school of thought that “Content Marketing” is simply old wine in a new bottle. Well, if that were the case, it’s pretty old content, right? So does “Content Marketing” have to be fresh, different, unique or special in some way? Does it need to deliver a distinctive point of view or tone of voice that can be discerned as the view of that brand, organisation or cause? If we ditch the idea of ‘karaoke’ or ‘copycat’ marketing as being inadequate in creating a point of brand differentiation, then surely the bar needs to be raised for “Content Marketing” in exactly the same way? A clue to this particular point of view can be discerned from looking at the membership of the CMA – agencies that produce content marketing for brands as well as publishers of such content. ‘Quality branded editorial content’ or ‘advertorials’ may have their place in marketing but shouldn’t “Content Marketing” be much wider than that? A bold claim made by the CMA is that “Content Marketing” is the second fastest growing media channel behind social and is now overtaking traditional advertising and is worth over £1bn a year in revenues. CMA also claims that 70% of UK adults consume at least one piece of content marketing on a monthly basis and 80% of content marketing consumers recommend products and services to others. “Content Marketing” is a channel? Isn’t that adding to the confusion that already exists in the minds of organisations and brands about “Content Marketing”? In fact, shouldn’t the channel be irrelevant as it’s the content that’s important? And isn’t the content developed for particular channels such as online and offline? It goes on to say that “Content Marketing” is focused not on selling, but on simply communicating with customers and prospects. Successful content marketing relies on providing “consistent, high-quality content that solves people’s problems”. 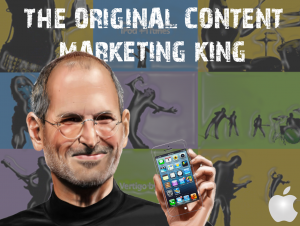 “Content Marketing” solves peoples’ problems? I thought solving peoples’ problems was called selling them a product or service? 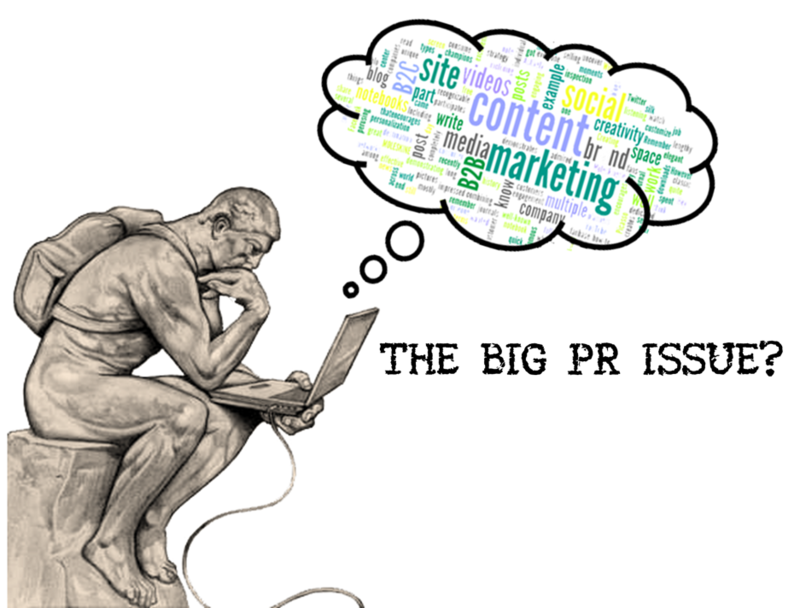 Call me old fashioned but haven’t we heard all of this stuff before and in any event, isn’t great PR about creating great content that captures the attention of an increasingly distracted customer, client, prospect or supporter? If we agree with the CMA that the average consumer has 379,000 brand experiences in a year and is exposed to 170 brand messages just on the way to work, then hasn’t “Content Marketing” got its work cut out to slow down the hapless consumer long enough so that the brand message or whatever can be received and acted on? In fact, isn’t sponsorship and endorsement of a product or service “Content Marketing” at a level that’s beyond ‘advertorial’? At that rate, Steve Jobs is the ultimate ‘King of Content Marketing’ although what he did was create iconic brand partnerships for the Apple brand with the likes of U2 and Disney. What’s clear is that some brand owners place a higher value on the creation of new content – for example ‘behind the scenes’ experiences for fans or celebrity endorsement from Hollywood ‘A’ list stars – that sprinkles ‘magic dust’ on seemingly boring and everyday products such as instant coffee, carbonated drinks, broadband internet, and even bank accounts. Some brand owners may eschew the description of this as “Content Marketing” and may prefer to talk of “Experiential Marketing” that the likes of Red Bull have turned into an art form. Whether you subscribe to this particular view or not, the chances are you’ll need to make decisions about what goes up on your website at some stage soon. And while information about your organisation, product or service is certainly valuable on the inner pages of the site, what visitors may be really interested in is content that identifies what the issue, challenge or problem they are facing looks like and then information on how to go about solving it. Once you’ve created an online relationship, it’s at that point you can begin to offer potential solutions that have been defined and articulated for each customer, client or supporter segment. Within this context, “Content Marketing” may well have a part to play in influencing future purchasing behaviour as well as enhancing the reputation of a brand, company, organisation or cause. Ardi Kolah is an elected Member of Council of the PRCA.